33rd Annual Artspring & Block Party! Artspring Exhibition & Block Party! Artspring March 29-31, 2019 - Call for Volunteers and Artists! 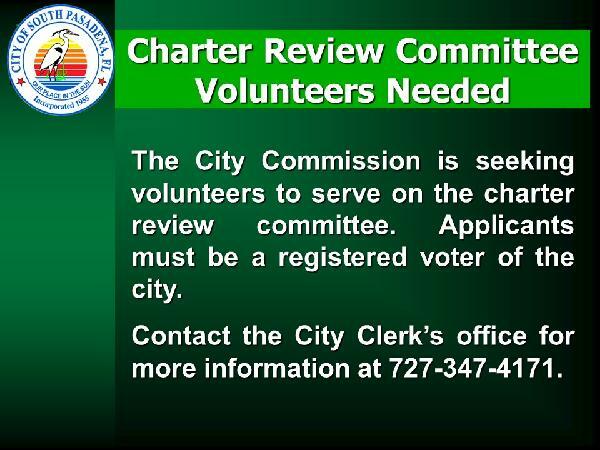 Charter Review Committee Volunteers Needed! 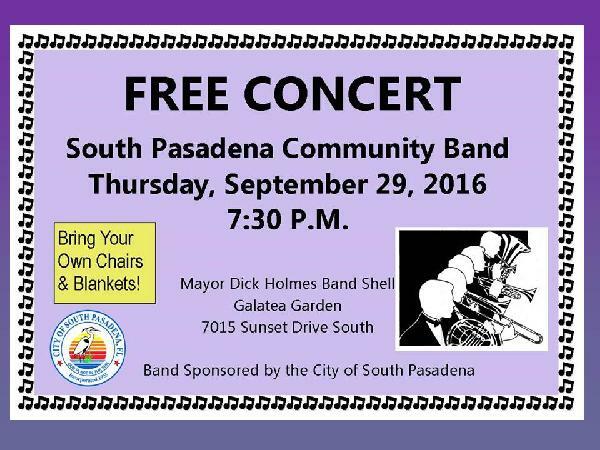 South Pasadena Community Band - Free Concert! The City is looking for a volunteer to serve on the Firefighters' Pension Board. For more information, call City Hall at 727-347-4171. Qualifications: shall have been a resident of the city for one year; shall be a duly qualified elector of the city. Any resident who is interested should contact the City Clerk's office at 727-347-4171 or in person at City Hall, 7047 Sunset Drive South. Applications should be submitted to City Hall by 4 PM on Wednesday, February 13, 2019. For the latest version of the City Connection newsletter, please visit: City Connection Winter 2018. This meeting will be rescheduled for a future date. South Pasadena Fire Department 2nd Annual Open House – Free Food, Fire and Police Demonstrations! Saturday, January 19, 2019 11:00 a.m. – 2:00 p.m.
Notice is hereby given to all registered voters within the corporate limits of the City of South Pasadena, Florida that the City’s general election scheduled for March 12, 2019 has been canceled. As only one candidate applied and qualified for Mayor and no one qualified for Commissioner, the election has been canceled. 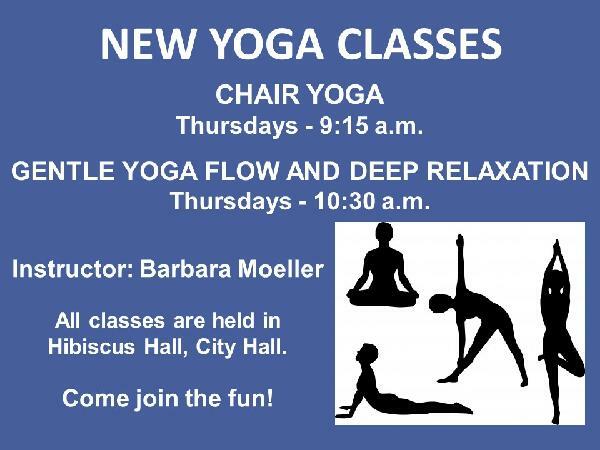 NEW YOGA CLASSES OFFERED AT CITY HALL! The City of South Pasadena, Florida will hold a municipal election on Tuesday, March 12, 2019 for the election of a Mayor and a Commissioner. Qualifying begins at 12:00 noon on November 1, 2018 and ends at 12:00 noon on November 15, 2018. Candidates shall have been a resident of the city for one year and shall be a duly qualified elector of the city. An informational meeting will be held on Monday, October 29, 2018 at 10:00 AM at City Hall for anyone interested in becoming a candidate for the March 12, 2019 election. For more information, please contact the City Clerk’s office at 727-347-4171. For the latest version of the City Connection newsletter, please visit: City Connection Fall 2018. The City of South Pasadena has contacted Pinellas County to be part of the cleanup effort for red tide. Pinellas County recommends if homeowners want to clean up their own dead fish they may bag it, seal it and place it in regular garbage cans for pick up. If you have any more questions or concerns, please contact Pinellas County directly at 727-464-4425 or email watershed@pinellascounty.org. Reclaimed water on Pasadena Island is going to be off until October 23, 2018. For more information, contact Public Works at 727-384-0701. The City of South Pasadena has submitted an application for Federal grant funding for a project titled Fire Station #20, Generator Upgrade Project. Please see the corresponding Public Notice here. Due to local road flooding, City Hall will closing at 1:00 p.m. on Wednesday, October 10, 2018. We anticipate opening as normal at 8:00 a.m. on Thursday, October 11, 2018. Residents are advised to be aware of local flooding conditions and drive with caution. Please See the Video Below from Pinellas County fire safety educators. At the July 2, 2018 Regular Commission Meeting the Commission awarded the $1,000 annual scholarship to Alexia Walker. She will be attending the University of Central Florida this Fall. Congratulations and well wishes! Thank you to all who submitted applications. We invite you to apply again in the future. For the latest version of the City Connection newsletter, please visit: City Connection Summer 2018. The City of South Pasadena is accepting sealed bids for the City Hall Stairway & Slab Improvements project until 2:00 PM on Monday, August 20, 2018. Specifications and contract documents may be obtained from Advanced Engineering Design, Inc. at 3931 68th Avenue North, Pinellas Park, FL 33781. 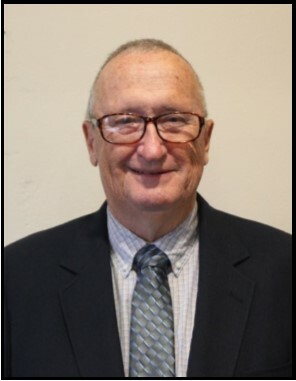 At the May 30, 2018 Special Commission Meeting, Ben Thomas was appointed to fill the vacancy created by the resignation of Commissioner Gigi Esposito. The City welcomes Commissioner Ben Thomas and looks forward to working with him this year. The City of South Pasadena is in the process of developing a Program for Public Information, also known as a PPI and we need your help! Please take a minute and respond to a short survey to help the Community Improvement Department identify and address needs within the city. Your participation could help the City's efforts to reduce local flood insurance rates! Cereal for Summer a Success! The City of South Pasadena delivered almost 400 boxes to 10News WTSP and Feeding Tampa Bay on Friday, May 11, 2018 to help feed needy families. We thank the International Association of Firefighters Local 747 who donated 200 boxes and all our residents, employees, and friends who made this possible. Effective May 21, 2018 at 4 PM, Commissioner Gigi Esposito resigned from the City Commission. The Commission will be addressing the vacancy created by her resignation at a Special Commission Meeting scheduled for Wednesday, May 30, 2018 at 4 PM in Commission Chambers. A formal meeting notice will be posted in advance of that date. The City is currently accepting applications for its annual scholarship in the amount of $1,000. The deadline to submit applications is May 31, 2018 at 4 PM. For information regarding the application process or eligibility, please click here. For the latest version of the City Connection newsletter, please visit: City Connection Spring 2018. 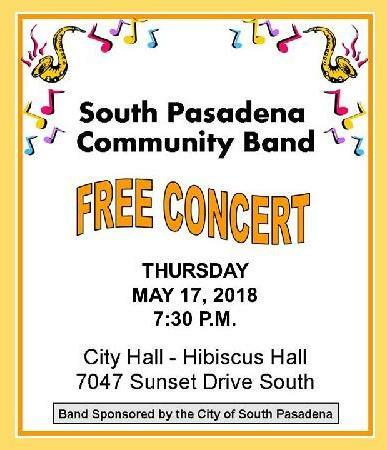 Free South Pasadena Community Band Concert! 32nd Annual Artspring and Block Party! 2018 Artspring Exhibition & Block Party! *Results are unofficial until certified by the Pinellas County Supervisor of Elections. Notice is hereby given to all registered voters within the corporate limits of the City of South Pasadena, Florida that a general election will be held on March 13, 2018 in the City of South Pasadena for the election of two Commissioners. The polling place for Precincts 212 & 214 is located at City Hall, 7047 Sunset Drive South. The polls will be open between the hours of 7:00 a.m. and 7:00 p.m.
To see the Sample Ballot click here. The City is looking for volunteers to help with the 32nd Annual Artspring Exhibition. Shifts are available on the following dates March 19- 26, 2018. Please consider donating a few hours of your time. Artists are also needed to exhibit their artwork in the following mediums: clay, fiber, wood, metals, glass, photography, paper or paint. Sculptures may be submitted in clay, wood, metals or glass. First, Second and Third Place ribbons will be awarded in three categories (artwork, photography, and sculpture), along with the Mayor's Award and Honorable Mention ribbons. No entry fee required. To register or for more information, please call City Hall at 347-4171. All City offices will be closed on Monday, February 19, 2018 in observance of Presidents' Day Holiday. A Meet the Candidates Forum was held Thursday, February 8th, 2018 and was televised on channel 643. If you missed it and would like to request a copy, please contact the City Clerk's Office at 727-347-4171. REGISTER TO VOTE! The deadline to register to vote in the March 12, 2018 election is February 12th, 2018! For information, please contact the Pinellas County Supervisor of Elections at 727-464-VOTE (8683). South Pasadena Fire Department First Annual Open House – Free Food, Fire and Police Demonstrations! For the latest version of the City Connection newsletter, please visit: City Connection Winter 2017. HOLIDAY BOAT PARADE - CANCELED! Due to inclement weather the December 8, 2017 South Pasadena & St. Pete Beach Lighted Holiday Boat Parade has been canceled. The administrative workshop sheduled for Tuesday, November 21, 2017 has been canceled. On November 7, 2017, voters will decide on the Penny for Pinellas renewal for years 2020-2030. For information about what Penny for Pinellas has meant to your local community in South Pasadena, please see page 2 of the Fall 2017 City Connection Newsletter. For more information about Penny for Pinellas and how it has served the entire county, please visit Pinellas County's Penny for Pinellas website. The City of South Pasadena, Florida will hold a municipal election on Tuesday, March 13, 2018 for the election of two Commissioners. Qualifying begins at 12:00 noon on November 1, 2017 and ends at 12:00 noon on November 15, 2017. Candidates shall have been a resident of the city for one year and shall be a duly qualified elector of the city. An informational meeting will be held on Wednesday, October 25, 2017 at 10:00 a.m. at City Hall for anyone interested in becoming a candidate for the March 13, 2018 election. If you need further information, please call the City Clerk’s office at 347-4171. For the latest version of the City Connection newsletter, please visit: City Connection Fall 2017. Draw a map of you home with all members of your household, marking two exits from each room and a path to the outside. Practice your home fire drill twice a year. Conduct one at night and one during the day with everyone in your home. Teach children how to escape on their own in case you can't help. Once you get outside, stay outside. Never go back into a burning building. For more information about Fire Prevention Week visit the National Fire Protection Association website here. 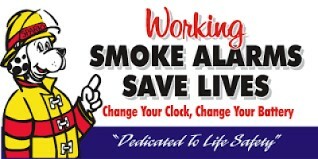 or call the South Pasadena Fire Department at 727-344-1666 to schedule a Fire Safety presentation for your community. Monday September 25, 2017 our debris hauler will start the removal process. ELIGIBLE DEBRIS-VEGETATIVE: branches, trees, shrubs, etc that are a direct result from Hurricane Irma ONLY. Bagged vegetative debris will NOT be accepted. Eligible debris C & D (Construction & Demolition) are as followed: fallen fences, roof material etc. Residents should separate your C & D from vegetative material. Residents should NOT put either C & D or vegetative debris next to: power poles, fire hydrants, mail boxes, trees, etc. Residents should put all ELIGIBLE DEBRIS next to the curb, NOT in the street. Your patience is greatly appreciated; please contact Public Works with any questions or concerns at 727-384-0701. To our citizens, vegetative debris generated by Hurricane Irma should not be placed in garbage cans. 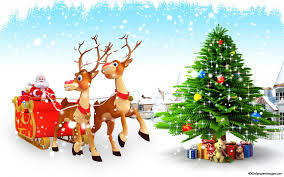 We are asking that you put them in the right of away, away from power poles, fire hydrants, trees, etc. 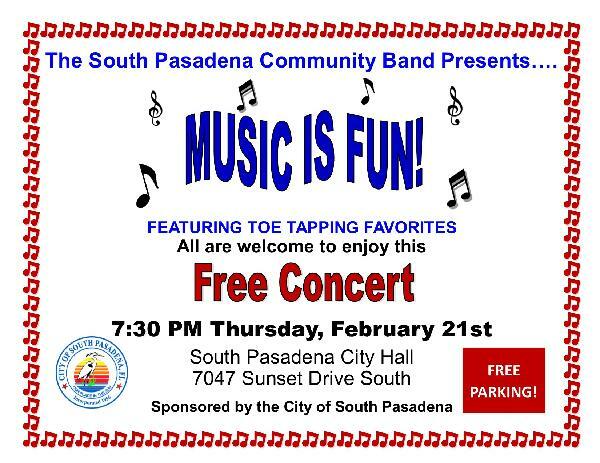 For questions, please contact Public Works at pworks@mysouthpasadena.com. Maynard A. Duryea Bay View Park has reopened. Due to unsafe conditions and debris following Hurricane Irma, Maynard A. Duryea Bay View Park is temporarily closed. We apologize for the inconvenience and will reopen the park as soon as it is deemed safe to do so. City offices have reopened today, September 12, 2017. Please note that some functionality and services may be temporarily limited but staff will assist the public as much as possible as resources and information becomes more readily available. City offices will remain closed on September 11, 2017 following Hurricane Irma. Please check back for information regarding when normal operations will be resumed. The September 11, 2017 Regular Commission Meeting has been canceled. Notices will be posted when the meeting has been rescheduled. the storm has passed. There are many hidden dangers following severe weather. Due to Hurricane Irma, City Hall is currently closed. DUE TO HURRICANE IRMA, THE SEPTEMBER 11, 2017 REGULAR COMMISSION MEETING HAS BEEN CANCELED. THE MEETING WILL BE RESCHEDULED AND RE-NOTICED AS SOON AS CONDITIONS PERMIT. As the peak of the Atlantic Hurricane Season approaches make sure that you and your family are prepared ahead of time. The short educational video from FEMA below will help you become better prepared. Beginning with the 2017 hurricane season, the National Weather Service (NWS) will issue storm surge watches and warnings to areas along the Gulf and Atlantic coasts. Storm surge is often the greatest threat to life and property from a tropical cyclone, and it doesn't always occur at the same times or locations as a storm's hazardous winds. All regularly scheduled Commission meetings have been canceled from July 4, 2017 to August 21, 2017. Commission meetings will resume on August 22, 2017. For information about Commission meetings, please contact the Administration Department at 727-347-4171. For the latest version of the City Connection newsletter, please visit: City Connection Summer 2017. The City is pleased to announce that David Mixson will be joining the Public Safety Department as Fire Chief, effective July 5, 2017. Mixson comes from the City of Largo where he has served in the fire department for twenty-three years. He has been hired to fill a vacancy created by the retirement of Fire Chief Dayton Saltsman on May 31, 2017. The City is currently accepting applications for its annual scholarship in the amount of $1,000. The deadline to submit applications is May 31, 2017 at 4 PM. For information regarding the application process or eligibility, please click here. For the latest version of the City Connection newsletter, please visit: City Connection Spring 2017. Notice is hereby given to all registered voters within the corporate limits of the City of South Pasadena, Florida that a general election will be held on March 14, 2017 in the City of South Pasadena for the election of two Commissioners. 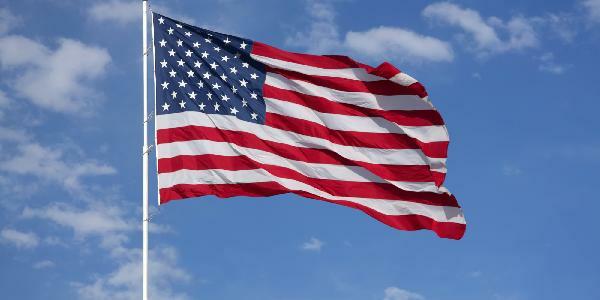 To see the full Notice of Election and Sample Ballot please click here. Save the Date - Artspring & Block Party! A Special Commission Meeting has been scheduled for Friday, February 24, 2017 at 3:30 p.m. in Commission Chambers - City Hall. For more information, click here for the agenda. The deadline to register to vote is February 13, 2017. REGISTER TO VOTE! The deadline to register to vote in the March 14, 2017 election is February 13th, 2017! 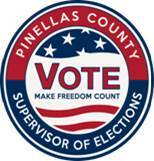 For information, please contact the Pinellas County Supervisor of Elections at 727-464-VOTE (8683). Calling All Artists & Volunteers! Artspring March 31 - April 2, 2017. 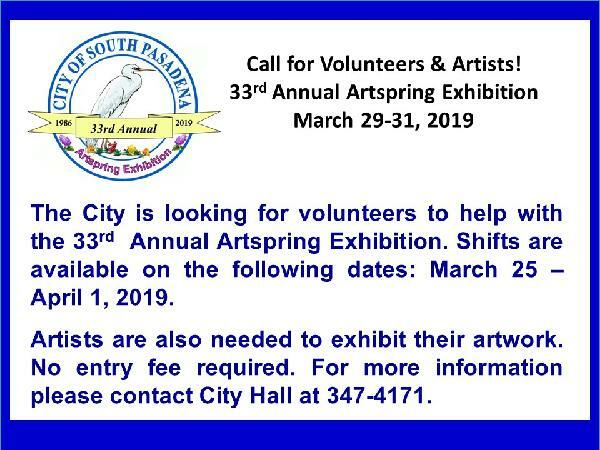 The city is looking for volunteers to help with the 31st Annual Artspring Exhibition. Shifts are available on the following dates March 27 - April 3, 2017. Please consider donating a few hours of your time. For the latest version of the City Connection newsletter, please visit: City Connection Winter 2016. The City of South Pasadena, Florida will hold a municipal election on Tuesday, March 14, 2017 for the election of two Commissioners. Qualifying begins at 12:00 noon on November 1, 2016 and ends at 12:00 noon on November 15, 2016. Candidates shall have been a resident of the city for one year and shall be a duly qualified elector of the city. An informational meeting will be held on Monday, October 24, 2016 at 10:00 a.m. at City Hall for anyone interested in becoming a candidate for the March 14, 2017 election. If you need further information, please call the City Clerk’s office at 347-4171. For the latest version of the City Connection newsletter, please visit: City Connection Fall 2016. City Hall hours will vary due to flooding concerns on Sunset Drive South resulting from Tropical Strom Hermine. Residents can call Pinellas County (727) 464-4333 with their preparedness questions or to report issues. Please should stay tuned for weather updates through weather alert radios, local media outlets, the county website (www.pinellascounty.org) and county social media accounts. Residents are also urged to sign up for Alert Pinellas at www.pinellascounty.org/alertpinellas. Pinellas County will continue to monitor the situation and provide updates at www.pinellascounty.org as they become available. The City is currently seeking proposals for Residential Curbside Solid Waste Service and Recycling Service and Commercial Solid Waste Service. Because additional time was required in order to accurately and appropriately respond to vendor questions, the City has extended the RFP submission deadline from 2:00 PM on July 28, 2016 to 2:00 PM on August 8, 2016. For additional information, Addendum #1, or to view the RFP packet, please click here. For addendums and additional information regarding current Requests for Proposal and Requests for Bid, please click here. For the latest version of the City Connection newsletter, please visit: City Connection Summer 2016. Sealed proposals for Solid Waste Services will be received by City of South Pasadena at 7047 Sunset Drive, South Pasadena, Florida 33707, until 2:00 p.m. on July 28, 2016. Due to flooding concerns on Sunset Drive South, City Hall will be closed on Tuesday, June 7, 2016. The regularly scheduled Agenda Meeting and Administrative Workshop will be held on Thursday, June 9, 2016 at 9:00 A.M. in Commission Chambers. After having to cancel the Block Party due to weather concerns, we are excited to announce that the event has been rescheduled! Come join us for fun, food, and entertainment on Saturday, May 21st from noon to 4 PM. The City is currently accepting applications for its annual scholarship in the amount of $1,000. The deadline to submit applications is May 31, 2016 at 4 PM. For information regarding the application process or eligibility, please click here. Due to storms and suspected high winds, the City of South Pasadena Block Party has been cancelled. The Artspring Exhibition will be open as posted from 10 AM to 3 PM. 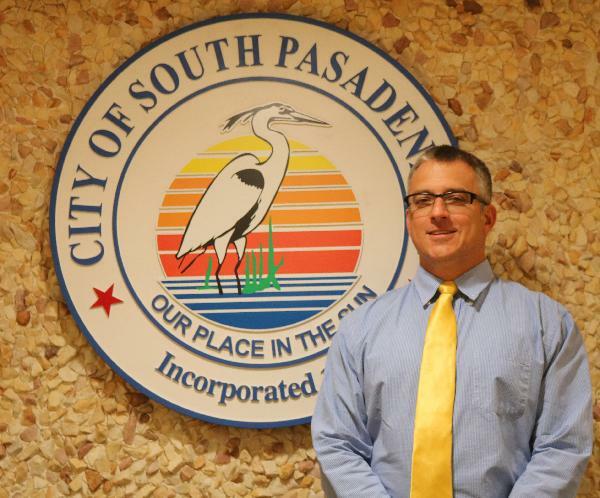 The City of South Pasadena is seeking a resident who is interested in filling a vacancy on the City Commission that will occur following the March 15, 2016 mayoral election. 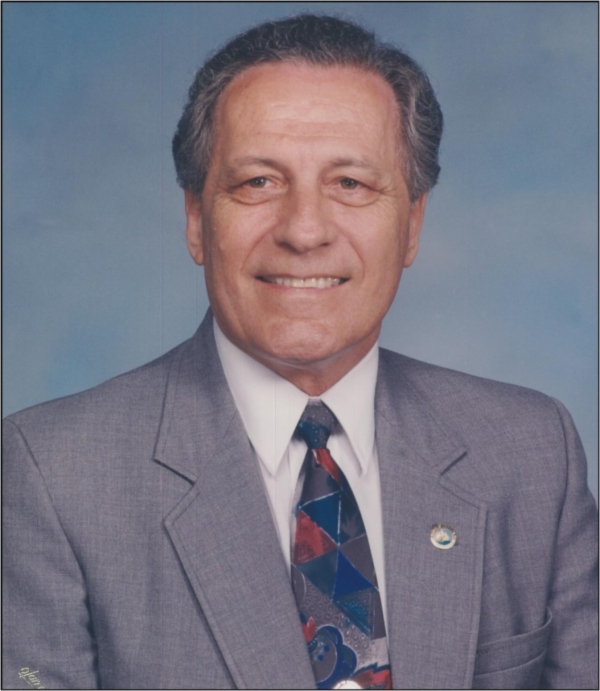 Notice is hereby given to all registered voters within the corporate limits of the City of South Pasadena, Florida, that a general election will be held on March 15, 2016 in the City of South Pasadena at which time there is to be elected a Mayor. Wednesday, February 10th at 7:00 p.m.
Attendees should arrive by 6:30 to write questions for the candidates. 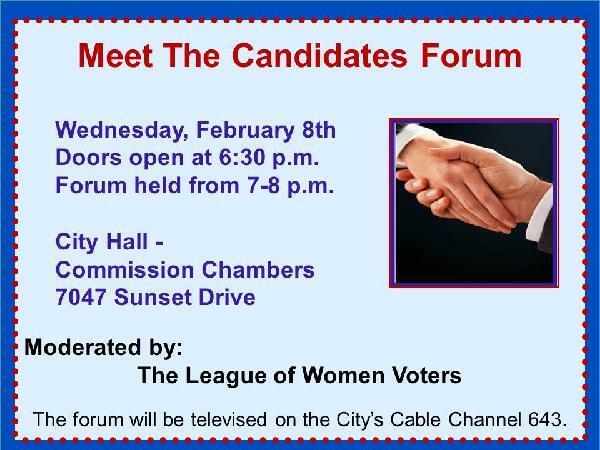 The forum will be televised on the City's Cable Channel 643. For more information call 727-347-4171. The city is looking for volu nteers to help with the 30th Annual Artspring Exhibition. Four hour shifts are available on the following dates March 28 - April 4, 2016. Please consider donating a few hours of your time. Artists are also needed to exhibit their artwork in the following mediums: clay, fiber, wood, metals, glass, photography, paper or paint. Sculptures may be submitted in clay, wood, metals or glass. First, Second and Third Place ribbons will be awarded in two categories (artwork and sculpture), along with the Mayor's Award and Honorable Mention ribbons. No entry fee required. 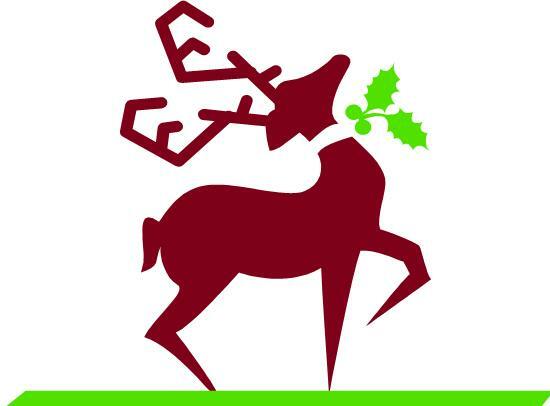 For the latest version of the City Connection newsletter, please visit: City Connection Winter 2015. South Pasadena's 2016 proposed millage rate is 3.625. For more information, please see our 2016 Proposed Millage Rate FAQs. Please be aware that there have been reports in South Pasadena of individuals looking for unlocked cars and stealing personal items from vehicles. Residents are encouraged to roll up car windows and lock car doors, even for vehicles parked in driveways. Also, residents are discouraged from leaving personal items and valuables in unattended vehicles. If you have any questions, please call the Pinellas County Sheriff's Office non-emergency line at 727-582-6200. In case of emergency, call 911. Starting Sunday, August 9, 2015, the Florida Department of Transportation (FDOT) will begin milling and repaving the outside lanes of Pasadena Avenue from Park Street to approximately 14th Avenue South. The work is scheduled to take place between the hours of 7 PM and 7 AM for approximately 5 days. Please be aware that there will be lane closures and detours to access certain side streets during the project. This is a state-funded project and questions/comments can be directed to the local FDOT office at 727-575-8300. Effective October 1, 2015, the resident co-pay to obtain a library card will increase from $15 to $25. For more information about the library card program, please click here. Two Special Commission meetings have been scheduled for Tuesday, July 14, 2015 at 9:00 a.m. and 9:30 a.m. in Commission Chambers located in City Hall, 7047 Sunset Dr. S.
The Pinellas County Clerk of the Court's office has launched a free Property Fraud Alert Subscription Service. The program, called Cover Your Assets, allows residents to sign up to be notified immediately, either by phone or email, of any document recorded against their property in the Official Records of the Pinellas County Clerk's office where deeds, mortgages and other documents are recorded. Please be aware that the City of South Pasadena is not a part of the Barrier Island Re-Entry Program organized by the Pinellas County Sheriff's Office. No special permits or placards will be required to re-enter the area following an emergency. The Pasadena Isle paving project is scheduled to start on June 5, 2015. The contractor will mill the entire island first along with the new curbs. The paving will then start in approximately 3 working days. Milling should run through June 8, 2015. Then the paving will start right after the milling – weather permitting and take 4 days. Any questions or concerns can be directed to the Public Works Department at 384-0701. City Scholarship Available - Apply Now! The City is accepting applications through May 31, 2015 for the City’s $2,000 scholarship. For more information, please visit the scholarship page here. 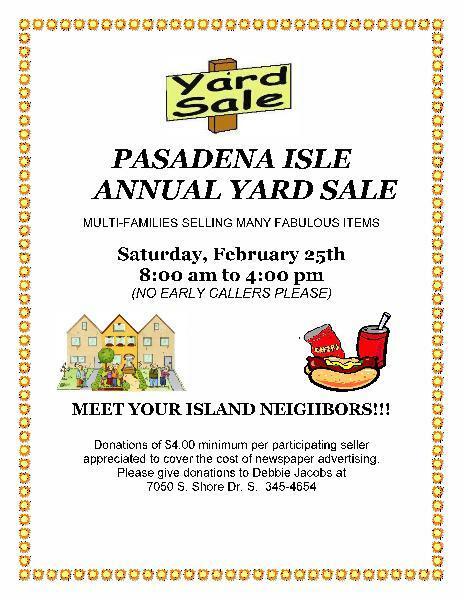 - Pasadena Avenue & Gulfport Blvd. - Pasadena Avenue & Park St.
Lane closures will occur nightly from 7:00 p.m. - 7:00 a.m. This project is expected to be completed in the fall of 2015. For more information email roadwork@dot.state.fl.us or call 727-725-7950. Bid Opening - April 9, 2015 at 2:00 P.M. 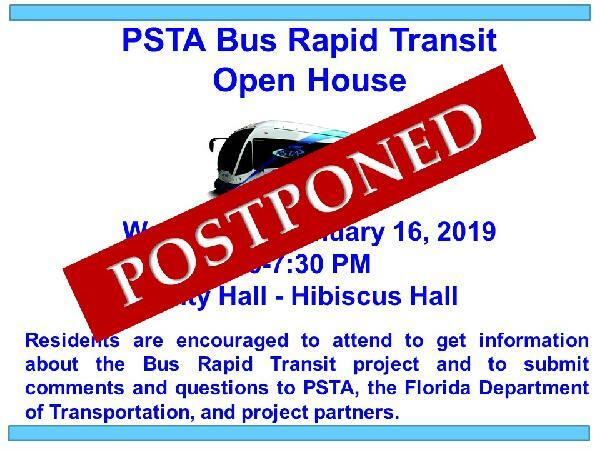 Sealed proposals will be opened at the City of South Pasadena, City Hall, 7047 Sunset Drive South, South Pasadena, Florida 33707, in Pinellas County, on April 9, 2015 at 2:00 P.M., They will be publicly opened and read aloud in the Commission Chambers. Click here for more information. For the latest version of the City Connection newsletter, please visit: City Connection Spring 2015. 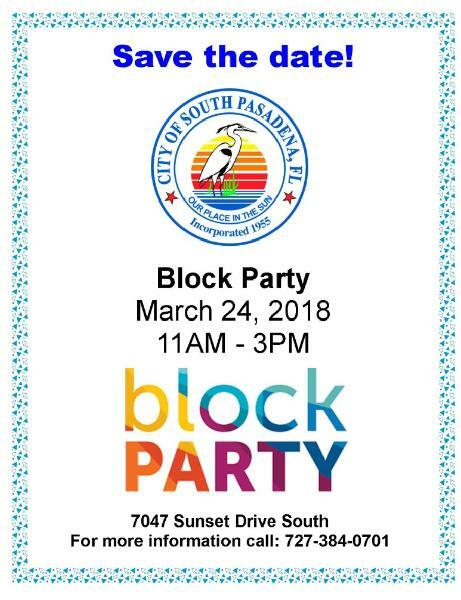 South Pasadena Block Party March 28th! City of South Pasadena Block Party! 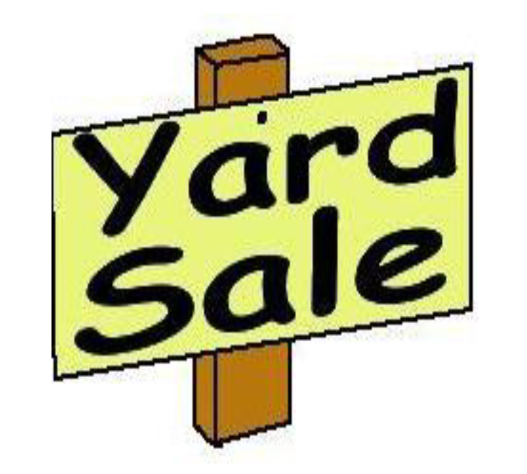 Saturday, March 28, 2015 12:00 noon - 4:00 p.m. Bay View Park, 7054 Sunset Drive. Food, music, entertainment, car show, children's activities, arbor day celebration, public safety demonstration. Free shuttle bus and parking! Mark your calendars! 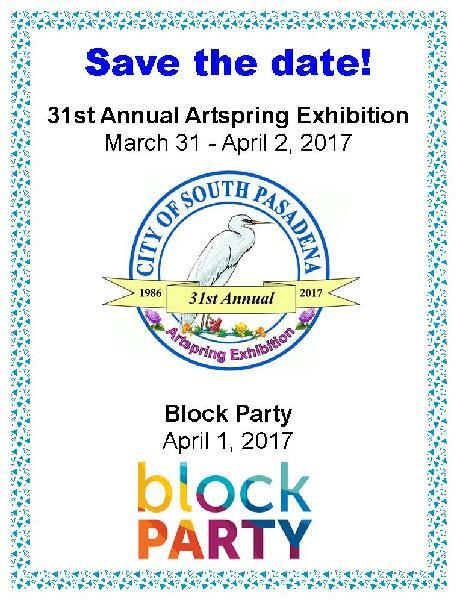 The City of South Pasadena's 29th Annual Artspring Exhibition is quickly approaching! Come out March 27-29 from 10 AM to 3 PM! Notice is hereby given to all registered voters within the corporate limits of the City of South Pasadena, FL that the general election scheduled for March 10, 2015 has been canceled as only two candidates qualified. The two candidates will be sworn in at the March 10th Regular Commission Meeting. The two candidates who qualified are Gail Neidinger and Lari Johnson. Sealed proposals will be received at the City of South Pasadena, City Hall, 7047 Sunset Drive South, South Pasadena, Florida 33707, in Pinellas County, until April 9, 2015 at 2:00 P.M., at which time and place they will be publicly opened and read aloud in the Commission Chambers at City Hall, 7047 Sunset Drive South, South Pasadena, Florida 33707, for furnishing necessary labor, materials, incidental items, and equipment for the Pasadena Isle – Mill and Resurface and Park Street – Pavement Restoration. Effective February 9, 2015, Bright House will be moving the City's government channel from channel 615 to channel 643. A Special Commission Meeting has been scheduled for Tuesday, December 23, 2014 at 9:00 A.M.
For more information, please see the agenda packet here. Bingo has been indefinitely canceled. 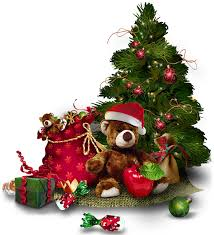 The final day of bingo will be held on Thursday, December 18, 2014 at 12:15 p.m.
Holiday Boat Parade, Open House, Tree Lighting & Concert! Friday, December 5, 2014 (approx.) 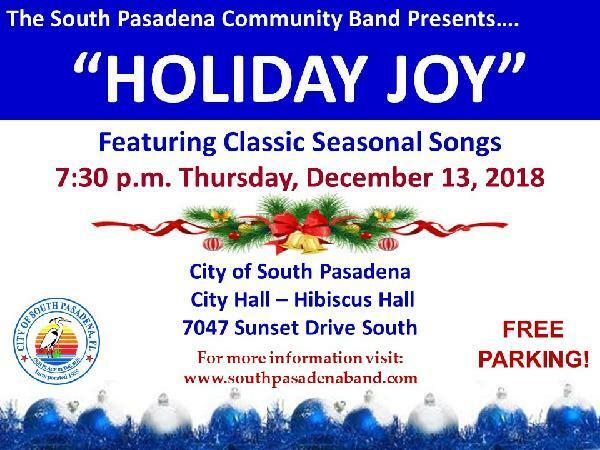 6:00 p.m.
Barbara Gilberg Habitat Park, 1600 Pasadena Avenue S.
City Hall Holiday Open House - New this year! Qualifying for the March 10, 2015 election was November 3, 2014 at noon to November 17 at noon. As only two candidates qualified, the election of two Commissioners has been canceled and the two candidates will be sworn in at the March Regular Commission Meeting. The two candidates who qualified are Gail Neidinger and Lari Johnson. 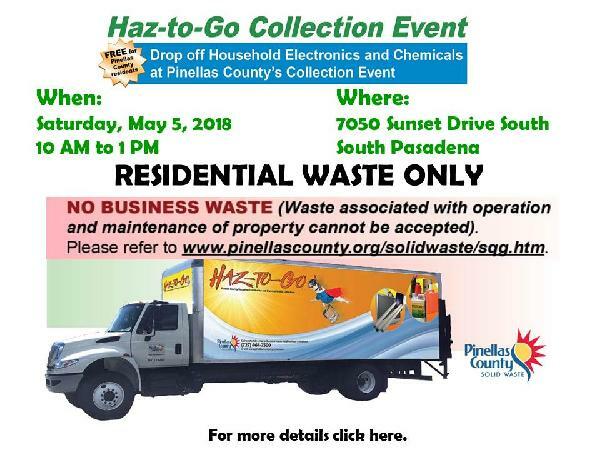 Free for Pinellas County residents. Businesses pay reduced fees. Saturday, November 15 from 9 a.m. to 2 p.m.
BINGO has been canceled for Thursday, October 23, 2014. BINGO has been canceled for Thursday, October 16, 2014. BINGO has been canceled for Thursday, October 9, 2014. BINGO has been canceled for Thursday, October 2, 2014. Please be aware that the Tuesday, September 16, 2014 Administrative Workshop has been rescheduled for Wednesday, September 17, 2014 at 9:00 A.M. Please be aware that the Tuesday, August 19, 2014 Agenda Meeting and Administrative Workshop have been rescheduled for Thursday, August 21, 2014 at 9:00 A.M.
A Special Commission Meeting has been scheduled for Tuesday, July 29, 2014 at 9:00 AM. For more information, please see the agenda posted on the Notices & Agendas page. All regularly scheduled Commission meetings between July 2, 2014 and August 18, 2014 have been canceled. Meetings resume on Tuesday, August 19, 2014. The city's new website, mysouthpasadena.com, officially launched Tuesday, July 1, 2014! With a fresh new look, new content, and user-friendly navigation, we hope that the new site will make it even easier for residents, businesses, and visitors to be informed and involved in the City of South Pasadena. Thanks for visiting! Check back for more news, event information and photos! In honor of Leverock's co-owner and philanthropist John Stross who passed away in May, the portion of Grevilla Avenue that runs next to Leverock's Restaurant will now bear his name.